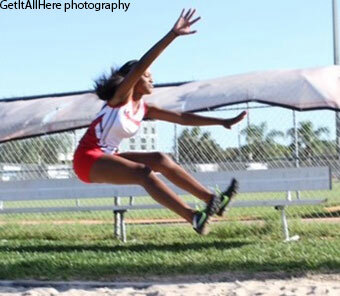 Courtney Gibson of Miami Southridge High School leaped her way in the long jump records books, when she produced 17’-10¼”, a new meet record, at the Hallandale Invitational on Saturday, March 7. The 2015 Hallendale Invitational, which had more than 40 schools participating, is recognized on the Florida Athletic calendar as one of the largest track and field meets in that State. Meanwhile, her coach, Dja Dugue (Coach D), said she has Gibson on a specific program with the goal of having her jump over 20ft (6.10m) this year. “Last year Courtney jumped her PR (Personal Record) of 19’-2” (5.84m) at the Bob Hayes Invitational in Jacksonville, Florida, and the goal going into this year’s meet was to have history repeat itself – another PR,” Dugue said. Listening to Coach D, one gets the sense that Gibson is a tenacious athlete who performs best when she is behind. She tends to perform to the level of her competition. On February 21, for example, while competing at the Lois Bing Classic in Miramar, Florida, Courtney cleared 18’-8¼” (5.69m) for fourth place overall, and just a mere two weeks later she sets a meet record with a shorter distance and came away with the gold medal. As a freshman last year, she went up against then senior Dominique Bullock and waged a fiercely contested battle against her. According to Coach D, Gibson is a naturally gifted athlete, but a big challenge for her is to learn how to combine her athleticism with the tenacity she is known for – whether it’s on the track or in the field – and be a pace setter.